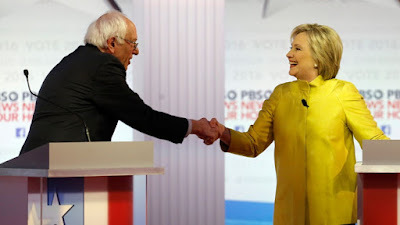 The Next Stage: Women and Retirement: Katha Pollitt on "Why Bernie Didn’t Get My Vote"
The problem is less that Bernie focuses on class and economic inequality than that he doesn’t seem to understand that the economy, like society generally, is structured by gender and race. Yes, Sanders could have done a better job explaining the impact of his proposals on women and people of color and demonstrating that he does indeed understand how the economy is “structured by gender and race.” But Sanders has made the critically important issue of economic inequality a front-burner issue. When I taught Women’s Studies at Community College of Philadelphia, I always stressed the interconnections of race, class and gender, and always tried to bring an intersectional analysis to whatever issue my students and I were grappling with. Fortunately, NOW has moved on to prioritize the struggle for racial justice as well as for gender justice. Would Sanders have been as successful getting Americans (whose leaders have generally shied away from issues of class) to take income inequality seriously if his stump speech had given equal time to issues of race/gender? Sander has been far more successful than most of us would ever have imagined in rehabilitating the term "socialism" and forcing Clinton to move left on economic justice. I wish Sanders would pay more attention to the way (as Pollitt puts it) the economy is structured by race and class. However, I see Sanders as far more capable of incorporating a focus on race/gender into his economic analysis than I see Clinton as likely to advance policies that would seriously address income inequality. But she is the presumptive nominee and now our task is to make sure she doesn’t pivot to the right in a foolhardy search for the votes of disenchanted Republicans.